San Beda coach Frankie Lim and San Sebastian volley mentor Roger Gorayeb yesterday hit the NCAA Policy Board’s decision for banning them for two seasons, saying the verdict was malicious, exaggerated and unfair. “The sanctions given were unthinkable, exaggerated and full of malicious intent, it seems to me there’s a concentrated effort to bring San Beda down,” Frankie Lim yesterday told The STAR. “It is unfair to both coaches to be deprived of their right to earn a decent living and unfair to my players who did nothing and got suspended. “There were only three things I did, protect my school, defend my player who was subjected to a racial slur, and lastly, defend myself. Now, does that merit a two-year suspension?” he added. “I’m surprised with the sanction the NCAA slapped on me, I was there as a coach of an official NCAA game and I was just defending myself from their assault, why gave me the same penalty,” said Gorayeb in Filipino. “It’s funny, they penalized (Dave) Marcelo even though he will not play anymore in the coming season. They were the ones who entered the court and hurt me, why the same penalty as Frankie Lim? “It took them three months to come up with this unfair decision, this is a bad precedent,” he added. Frankie Lim also suspects that the Policy Board had been fed by wrong information since the decision was based on the recommendation of the Management Committee that investigated the incident. “Perhaps the Policy Board was misinformed about the truth of the incident otherwise they would not come down hard,” said Frankie Lim. “It is my hope that the policy board would consider a non-partisan committee to investigate the incident and to come out with a fair and impartial decision,” he added. Despite the decision, Lim, who steered the Lions to five straight championship appearances, winning four titles, and Gorayeb, who has been with the SSC volley program for almost three decades now, thanked their school for standing by them. “I wish to thank the whole San Beda community for their prayers and overwhelming support,” said Lim. “I asked them what’s my status with the school and they say I’m still there coach and I thank them for supporting me all the way,” said Gorayeb, who will train the team but will not sit during game time if the suspension is upheld. San Beda and San Sebastian expected to challenge the verdict as a result of a brawl involving the two coaches and several players during a women’s volley game at San Beda’s St. Placid Gym in Mendiola last December. San Beda’s Nigerian center Olaide Adeogun, set to play next season after years of residency, and Julius Armon were also banned from entering any NCAA venue next year for their involvement in the fracas. San Beda’s Kyle Pascual, Jake Pascual, Jaypee Mendoza, Rysie Koga, Rome dela Rosa, Jose Carmelo Lim, Sudan Daniel, Mar Villahermosa, Baser Amer and Antonio Caram were also slapped one-game suspension each for entering the court during the fight. Marcelo, for his part, was slapped an eight-game suspension – three “for instigating a fight/brawl,” another three games for participating in the fight and two more for forcibly entering the court and disrupting play. Garvo Lanete was also suspended for one game for also entering the court. The sanctions on Marcelo and Lanete, however, might just be changed to fines since both had played their fifth and last season and will no longer see action in the upcoming season. Ed Cordero, a member of Lim’s coaching staff, will be suspended for one game for forcibly entering the game and another one for disrupting the ongoing volleyball match during the incident. The NCAA on Tuesday handed down two-year bans for San Beda basketball coach Frankie Lim and San Sebastian volleyball coach Roger Gorayeb for their respective roles in a melee at the San Beda campus last December. The two coaches engaged in a heated verbal exchange that led to a fracas during an NCAA volleyball game at the St. Placid’s Gym in San Beda. Gorayeb and a female San Sebastian volleyball player, Mae Crisostomo, were hurt during the incident. The incident started after San Beda’s Nigerian center Ole Adeogun heard chants by male San Sebastian volleyball players that he perceived as a racial slur. But the spikers denied the charge, saying they were misheard and that they were only shouting a standard volleyball warm-up chant that was not directed at Adeogun. Apart from Frankie Lim and Gorayeb, incoming Red Lions members Adeogun and Julius Armon were also given bans for next season. The two players are also barred from entering any NCAA venue as supporters in Season 88. Center Dave Marcelo was handed a three-game suspension for his role in the melee, while one-game sanctions were handed to Red Lions Kyle Pascual, Jake Pascual, Jaypee Mendoza, Rysie Koga, Garvo Lanete, Rome de la Rosa, Melo Lim, Daniel Sudan, Mar Villahermosa, Baser Amer and Anjo Caram. San Beda assistant Ed Cordero was also slapped a one-game suspension. The full statement from the NCAA follows. The NCAA, through Dr. Ramon C. Cercado, Mancom Chairman, would like to announce the decision of the Policy Board on the recommendations of the NCAA MANCOM investigating body on the December 2, 2011 SBC / SCCR incident. Mr. Olaide Adeogun and Mr. Julius Armon are banned from entering any NCAA venue for the rest of Season 87 and all of Season 88, as supporters under Section 4.4.3.9 of the Constitution. They cannot yet be considered as NCAA players because they have not yet submitted themselves to the NCAA eligibility process. Kyle Pascual, Jake Pascual, Jaypee Mendoza, Rysie Koga, Garvo Lanete, Rome de la Rosa, Jose Carmelo Lim, Daniel Sudan, Mar Villahermosa, Baser Amer and Antonio Caram are given a one (1) game suspension under Article 4, Section 4.4.3.9 of the NCAA Constitution and By-Laws for forcibly entering the San Beda gym, and one (1) game suspension under Article 4, Section 4.4.3.9 of the NCAA Constitution and By-Laws for disrupting the ongoing volleyball game between University of Perpetual Help System Dalta (UPHSD) and San Sebastian College Recoletos. These sanctions should take effect at the beginning Season 88. David Paul Marcelo be meted with three (3) games suspension for instigating a fight/brawl pursuant to Rule # 8.1.1.1. of the NCAA Manual of Operation; three (3) games suspension for participating in the fight pursuant to Rule # 8.1.1.2.NCAA Manual of Operation; one (1) game suspension under Article 4, Section 4.4.3.9 of the NCAA Constitution and By-Laws for forcibly entering the San Beda gym while the volleyball game between University of Perpetual Help System Dalta (UPHSD) and San Sebastian College Recoletos was ongoing; and one (1) game suspension under Article 4, Section 4.4.3.9 of the NCAA Constitution and By-Laws for disrupting the ongoing volleyball game between University of Perpetual Help System Dalta (UPHSD) and San Sebastian College Recoletos. These sanctions should take effect at the beginning Season 88. 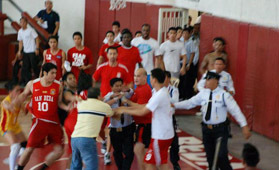 Edgardo Cordero be meted with the penalty of one (1) game suspension under Article 4, Section 4.4.3.9 of the NCAA Constitution and By-Laws for forcibly entering the San Beda gym while the volleyball game between University of Perpetual Help System Dalta (UPHSD) and San Sebastian College Recoletos was ongoing; and one (1) game suspension under Article 4, Section 4.4.3.9 of the NCAA Constitution and By-Laws for disrupting the ongoing volleyball game between University of Perpetual Help System Dalta (UPHSD) and San Sebastian College Recoletos. These sanctions should take effect at the beginning Season 88. Coach Frankie Lim and Coach Roger Gorayeb are banned from joining any NCAA sponsored tournament for Seasons 88 and 89 under Rule # 8.1.1.5 of the NCAA Manual of Operation. For unserved sanctions, Rule # 8.1.1.6 and # 8.1.1.7 of the NCAA Manual of Operation shall be strictly applied. 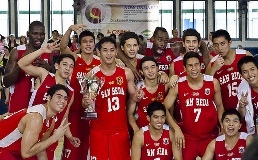 San Beda Lions declared overall NCAA Champions. Beda’s supremacy isn’t limited to basketball alone. Buoyed by victories in table tennis, football and swimming, San Beda bagged the general championship for the second straight year Friday at the close of the NCAA Season 87. The San Beda Lions, who also posted runner-up finishes in men’s volleyball and women’s taekwondo, amassed 435.5 points to edge St. Benilde (427) and Letran (395.5) for the crown. San Beda’s conquest was announced Friday during the NCAA closing ceremonies at the FilOil Flying V Arena, where host Perpetual Help captured the cheerdance crown. Executing their routine with grace and precision, the Altas Perps Squad tallied 335 points to best a strong field for the P100,000 prize. It was Perpetual Help’s sixth title since 2004, when the league started holding the cheerdance competition. Mapua wound up second with 304, while Letran finished third. Jose Rizal U retained its track and field title at the Rizal Memorial Stadium Thursday with a whopping 740 points. John Albert Mantua, who bagged a gold and a pair of silver medals, took the Most Outstanding Athlete honor. “Its a proud feeling; we’re delighted with the performance of our athletes,” said Jose Rizal’s NCAA management committee representative Paul Supan, whose track and field coaching staff is composed of Rosito Andaya, Elma Muros-Posadas and Jojo Posadas. Southeast Asian Games silver medalist Mervin Guarte of San Sebastian emerged as the most bemedalled athlete with four wins, two of them in the 1,500m and 3,000m races. 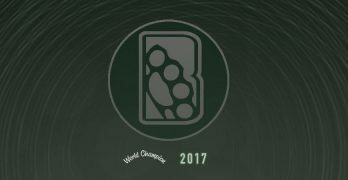 The Blazers topped women’s table tennis, chess, women’s taekwondo and finished second in lawn tennis, men’s table tennis, men’s taekwondo swimming and football. The Knights reigned supreme in lawn tennis, while posting bridesmaid finishes in women’s volleyball andwomen’s beach volleyball. San Sebastian nailed its third straight junior division overall title with 258.5 points. The defending champion San Beda Red Lions clinched a three-peat in the men’s division while the National University (NU) Lady Bulldogs claimed their first ever women’s crown last Saturday in the 8th Fr. Martin Collegiate Open Cup basketball finals. Jake Pascual banged in a game-high 20 points, while Julius Armon hit 16 points to help the San Beda Red Lions breeze past the Arellano University Chiefs, 89-66, in the winner-take-all men’s finals at the Trinity University of Asia gymnasium in Quezon City. Romeo de la Rosa and Ola Adeogun also made significant contributions by finishing with 15 and 14 points, respectively. Baser Amer provided 10 points for the Red Lions, and he made four points during a decisive 10-0 run in the last two minutes of the second period. Amer’s timely baskets allowed the Red Lions to turn the tables around on the Chiefs, who last led 28-27, off a triple by Rocky Acidre with 5:02 to go. With the Chiefs’ prized recruit Keith Agovida held to just nine points all throughout, the Red Lions had little trouble moving further ahead after they posted a 42-30 spread off Armon’s trey with 1:19 left in first half. The Pascual boys, Jake and Kyle, then took turns in widening San Beda’s advantage to 18 with their inside plays, 61-43, with 5:12 left in the third. Another trey from Armon in the last 6 minutes saw San Beda grabbing their biggest advantage at 23, 83-60. San Beda Red Lions coach Frankie Lim said their three-peat conquest has inspired the team to be at their best in the coming 88th season of the NCAA. Meanwhile, the Lady Bulldogs squandered a 14-point advantage then relied on a triple from Ma. Teresa Pama to bail them out of trouble and bag their first-ever women’s plum with a 72-67 triumph over the College of St. Benilde (CSB) Lady Blazers. Kristine Tolentino topped the Paul Du-coached Lady Bulldogs with 19 points, while Eden Alla delivered 14 to help power NU to their first women’s title. The Lady Blazers, fighting back from 14-points down at the end of the third, managed to threaten 67-68, in the last 58 seconds behind three treys. But the Lady Bulldogs were able to escape in the closing minutes after Pama unloaded a triple and Alla sank a gift shot in the remaining 23 seconds. He’s often honored for his immense cage talent, but even off court, Ateneo’s Kiefer Ravena makes a good impression. Kiefer Ravena will receive the Smart MVP award in the Collegiate Basketball Awards as the UAAP-NCAA Press Corps recognizes not only his cage exploits but also his other inspiring contributions. The awards night, where Kiefer Ravena will also receive the Collegiate Mythical Team plum, is set this Saturday at the Gateway Suites in Araneta Center, Cubao. Kiefer Ravena, the UAAP Rookie of the Year and Mythical Team member, recently spearheaded a fundraiser that gathered varsity stars and showbiz celebrities for a one-game exhibition. Proceeds of the charity game, which raised a sizable amount, were given to the victims of Tropical Storm “Sendong” in Cagayan de Oro. “It’s good to win, but it also feels good to help,” said the 18-year-old Kiefer Ravena. Kiefer Ravena, a member of the national under-16 and under-18 teams, again donned the country’s colors as the youngest member of the Sinag Pilipinas team that bagged the championship of 2011 Southeast Asian Games. Joining Kiefer Ravena in the Collegiate Mythical Team are NCAA MVP Calvin Abueva of San Sebastian, UAAP MVP Bobby Ray Parks of National University, Ateneo’s Greg Slaughter and San Beda’s Garvo Lanete. Ateneo tactician Norman Black (UAAP Coach of the Year) and San Beda mentor Frankie Lim (NCAA Coach of the Year) will also receive recognition in the event organized by scribes from major print and online publications and Smart. Other awardees are Ateneo’s Nico Salva and San Beda’s Dave Marcelo (Pivotal Players), Far Eastern University’s RR Garcia (Court General) and Aldrech Ramos (Mr. Efficiency), San Sebastian’s Ronald Pascual (Impact Player) and Ian Sangalang (Mr. Efficiency), Ateneo’s Emman Monfort (Maynilad Super Senior) and Kirk Long (Defensive Stopper) and Letran’s Kevin Alas (Energy Player). A historic title romp in a nationwide tournament has earned San Sebastian Stags a fitting recognition in the Collegiate Basketball Awards. The Stags, who recently emerged as the first NCAA team to capture the Philippine Collegiate Champions League crown, will receive the Distinction for Excellence in the annual event hosted by the UAAP-NCAA Press Corps and Smart on Jan. 21 at the Gateway Suites in Cubao. “I told them not to be complacent, to push themselves to the limit,” said coach Topex Robinson of his Stags, who stunned four-time UAAP champion Ateneo in the Finals just over two weeks ago. The Stags’ feat also spoiled the Blue Eagles’ bid for a record third straight crown in the tournament that gathers the best varsity teams in the country. San Sebastian’s main man Calvin Abueva, the reigning NCAA MVP, also leads the individual awardees with a slot in the Mythical Team along with Ateneo’s Greg Slaughter and Kiefer Ravena, San Beda’s Garvo Lanete and UAAP MVP Bobby Ray Parks of National University. PCCL MVP Ian Sangalang, the reedy center who helped power the Stags to the NCAA Finals, will share the Mr. Efficiency honors with Far Eastern University’s Aldrech Ramos. Also earning recognition are Ateneo’s Nico Salva and San Beda’s Dave Marcelo (Pivotal Players), FEU’s RR Garcia (Court General), San Sebastian’s Ronald Pascual (Impact Player), Letran’s Kevin Alas (Energy Player) and Ateneo’s Emman Monfort (Maynilad Super Senior) and Kirk Long (Defensive Stopper). The champion coaches will be similarly feted with Ateneo’s Norman Black earning his fourth straight UAAP Coach of the Year plum and San Beda’s Frankie Lim receiving the NCAA Coach of the Year honor. Coach Norman Black of Ateneo Blue Eagles and Coach Frankie Lim of San Beda Red lions named as country’s top coaches. Two champion coaches will share the limelight when the UAAP-NCAA Press Corps and Smart hold the Collegiate Basketball Awards on Jan. 21. Ateneo tactician Norman Black, who steered the Eagles to a fourth straight UAAP title, and Frankie Lim of NCAA back-to-back titlist San Beda will share coach of the year honors for the third time in the annual event at the Gateway Suites in Cubao. In another remarkable campaign, Black took a well-drilled and disciplined Ateneo squad to the UAAP summit with a good mix of rookies and veterans on his roster. A firm believer of the mantra that “defense wins championships,” Black, a grand slam coach in the PBA, will be receiving his fourth coach of the year award. The Eagles finished the season with a 13-1 record, ousted University of Santo Tomas in the Final Four, before sweeping Far Eastern U in the best-of-three finals. Black capped the year with an accomplishment in the international front by steering the Sinag Pilipinas team to a gold-medal run in the 2011 Southeast Asian Games last November in Indonesia. Lim will get his third citation as he helped sustained San Beda’s success just a year after the Lions achieved a perfect season in the NCAA. Squeezing the best out of his role players in the absence of former MVP Sudan Daniel, Lim piloted the Lions to a 16-2 record, before eliminating Jose Rizal U in the Final Four. Ranged against a familiar foe in San Sebastian in the finals, the Lions—taking Lim’s instructions to heart—came out on top of a bruising series for a record-tying 16th crown. 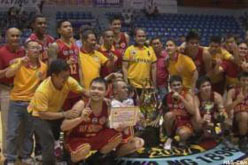 It was Lim’s fourth title in five years as coach of his alma mater. Black’s two prized rookies in Kiefer Ravena and Greg Slaughter are also part of the Mythical Five that will be awarded during the program. Lim joins Lions shooting guard Garvo Lanete in the honor roll, which also includes Bobby Ray Parks of National University and Calvin Abueva of San Sebastian.